Look, we get it. Breakfast is the most important meal of the day, and sometimes you just don't want to choose between pancakes and biscuits. The Richmond area certainly has no shortage of breakfast and brunch spots, and just about anywhere you go on the weekend you'll be in spitting distance of freshly baked biscuits, eggs Benedict with pimento cheese and mimosas with freshly-squeezed orange juice. But sometimes breakfast calls for a little bit (or a lot) of everything, and the down-home, Southern Cold Harbor Restaurant in Mechanicsville fits the bill. 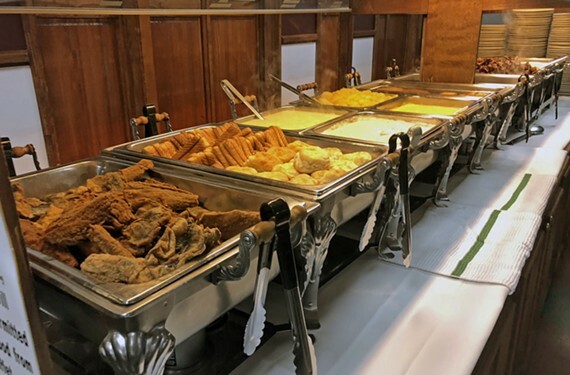 The breakfast buffet is available Friday, Saturday and Sunday mornings for $11.99 (kids 6 and younger can eat for $6.99). The all-you-can-eat buffet offers just about every classic breakfast item under the sun, starting with the carbs: biscuits, toast, pancakes and cornbread, plus breakfast potatoes. In the meat category you've got ham, sausage links, sausage patties, corned beef hash, and enough crispy bacon to make Ron Swanson's head spin. Of course you'll find piles of fluffy scrambled eggs, plus gravy to slather on top of everything. And if you need something a little fresh to balance it all out, there's mixed fruit and fresh pineapple. Coffee and orange juice aren't included on the buffet, so be sure to order those separately.